Editor’s note: Monica Kucera is a junior at DePaul University double majoring in Journalism and Public Relations/Advertising. She is studying abroad for a semester in Greece through The College Year In Athens Program. ATHENS -- Greece has always been a thriving country that has built its confidence throughout history and learned to recover from misfortunes. Despite being defeated by the Persians at Thermopylae in 481, the 300 Spartans stood their ground and upheld the most amount of pride one could ever show for their country by fighting to their death. In 1821, Greeks fought for their independence and also rehabilitated communities after many losses received during World War II. But Greece’s latest battleground isn’t being fought with weapons –- but with money. The “get rich fast and spend even faster” mentality had people living beyond their means since Greece became a member of the Euro zone in 2002. Greece’s debt totaled nearly $300 billion in 2009 and has continued to grow as years passed. In 2010, Euro zone members and the International Monetary Fund (IMF) agreed to a bailout package worth 100 billion euro ($145 billion). Then, in Feb. 2012, Greece received a second bailout of loans worth more than 130 billion euro ($173 billion). Looks of pure distress were seen throughout Syntagma Square, chants of desperate demonstrators were heard and the faces of hundreds who wanted nothing but perseverance for their country gathered to voice their concerns. Besides the obvious anguish on the looks of innocent faces, anyone in the surrounding area would hear the groups of protestors chanting, “Ψωμί! Μóρφωση! Ελευθερία!” (Bread, Education, Freedom… The necessities to a successful life in Greece). This moment was acknowledgement that the country was crying for help. This specific day was about to determine the future of Greece as a nation. Austerity measures and bills were discussed and revealed, but in essence, life as the Greeks knew it was about to drastically change. Parliament finalized bailout action for Greece’s economic situation, which included, but not limited to, salary cuts in the public sector, pension cuts, increased taxation and decreasing minimum wage. The new austerity measures are “felt by everyone,” said John Psaropoulos, freelance reporter and writer of The New Athenian blog. Also, pain in the private sectors stem from the lowering of minimum wage by 22 percent, meaning monthly income before tax will go from 751 euro ($999) to 600 euro (just under $800). For people under 25 years of age it goes down 30 percent to 526 euro (nearly $700). At this point in time, national unemployment is at 21 percent and for ages between 18-30 it is at a staggering 50 percent. “People have acted in a sophisticated manner,” political science professor at The College Year In Athens, Philippos Savvides said. They use their freedom for speech in an appropriate way, even though society is portrayed negatively in the media, he said. But it lies much deeper than what can be seen on the surface. As an outsider what you see are the documented artifacts about the tax increases, wage cuts and nation wide debt, but you don’t hear about the stories in which people are personally affected. Citizens all across the board are affected whether they live in Athens or on an island in Greece. The repercussions are felt nation wide. While visiting Paros this past weekend, I had a conversation with my tour guide about the effects of the austerity measures. Life on Paros appeared to be laid back, carefree and the charisma of people would never imply any anxieties were troubling their lives. How is life in Athens so chaotic while life on islands seems nothing short of perfect? Nikitas explained that since the government taxes are so high, at the end of the day he only goes home with about 15 percent of his profit. Despite the easygoing Greek lifestyle, waking up every day is a constant reminder of the economic situation. They might not show it, but they feel it. In a cry for help, however, attitudes could change after the G8 summits May 18-19 at Camp David, he said. While not a part of the Group of Eight globalized economies, Greece and its economy will definitely be a topic when world leaders discuss the struggling economies in European countries. 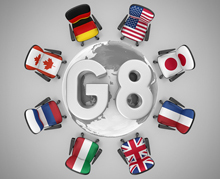 “If the G8 makes decisions that will affect global economy, it might have a long-term impact on Greece.” Savvides said. However, it’s hard to tell what may come out behind closed doors at the summit, those interviewed said. At the seminar with the U.S. 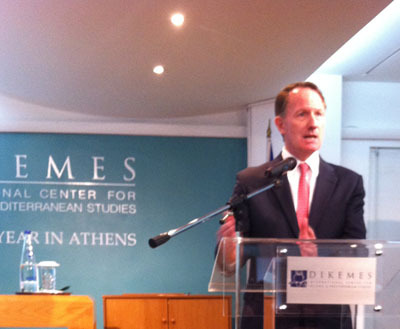 Ambassador, Smith had said anything that stimulates global growth will help Greece. 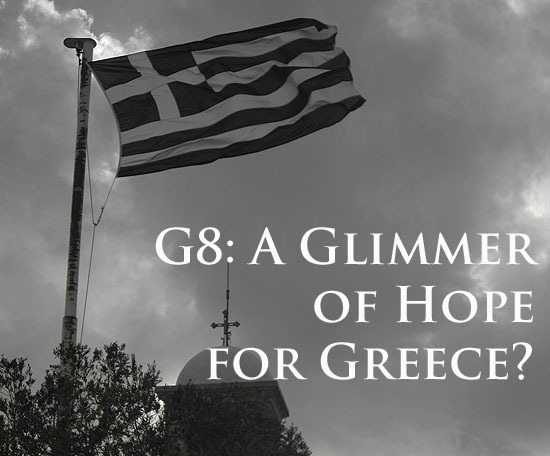 However, it’s likely the topic of Greece alone won’t solely be discussed at the summit. Ritsa Panagiotou, a professor on the European Union at The College Year in Athens, added that the agenda at the G8 summit doesn’t involve making policies and decisions that are implemented later. Ultimately, the European Commission, the European Central Bank and the IMF (International Monetary Fund) have the power to carry out policies. This trio of powers is commonly known as the τροικα, or ‘’Troika’’ in Greece. Despite the everyday stress permeating the air of Athens, some people are still able to see the bright side of the situation.